(CNN) Two bison are standing in silhouette at Yellowstone National Park as the winter morning sun rises, shaking off the ice from a bitter cold night. Those bison are among 16 natural and cultural treasures that have been picked to star in a pane of Forever stamps celebrating the National Park Service’s centennial birthday. The June 2 first-day-of-issue ceremony took place at the 2016 World Stamp Show in New York, the world’s largest stamp show that only happens once per decade. The National Park Service pane features 16 different stamps showing photographs or paintings of national parks or plants, animals, artwork, objects and structures found in or above the national parks. “This beautiful stamp series showcases the variety of national parks available for all to enjoy,” said National Park Service Deputy Director Peggy O’Dell. It’s not the first time the Postal Service has honored the national parks. Eight stamps honoring the Yellowstone centennial, the world’s first national park, were issued in 1972. 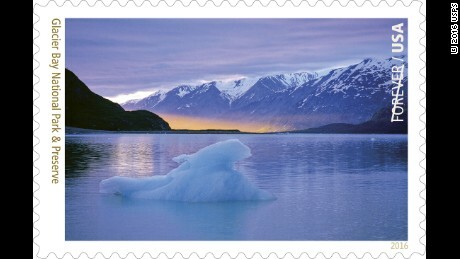 Centennial birthdays aside, the competition for stamp ideas is usually pretty tough: The U.S. Postal Service receives about 40,000 suggestions for stamp ideas each year and only about 20 topics make the cut.